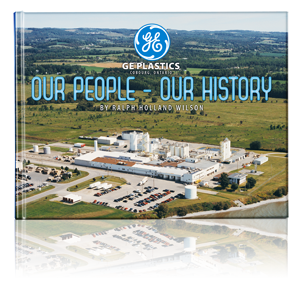 The management of GE Plastic’s plant in Cobourg, Ontario approached Wallbridge House Publishing to produce a book celebrating the company’s 40th anniversary. Copies of the book would be given to past and present employees, and used for promotional purposes. The real story lay in the people who operated the plant. More than once the plant was threatened with closure by parent corporations which owned the company. Each time, the staff of the plant found a way to survive by discovering a niche market. Author Ralph Holland Wilson turned to the people, and through dozens of interviews produced a lively and compelling story about the employees of GE Plastics. Hence the title Our People – Our History. For them, it was a testament to their innovation and a thank you for their role in helping the plant survive. Every company has a history and a story to tell. This is how GE Plastics told its tale. If you want to tell your company’s history, contact Wallbridge House Publishing.